SANI-TRED® products have successfully repaired many pools that had been considered un-repairable. SANI-TRED® swimming pool coating products can be used to repair, seal, and completely waterproof concrete, fiberglass, gunite pools and more. Swimming pool repair and waterproofing requires a coating that is capable of retaining a lot of negative hydrostatic pressure. Negative hydrostatic pressure is underground water pressure that pushes against substrates and is the leading cause of swimming pool leaks. SANI-TRED® holds strong against this hydrostatic pressure and keeps it from getting through your concrete and causing a full-on leak. SANI-TRED® penetrates deep into the concrete’s pores and hardens, forming “plugs” that stop water from getting through, making it the perfect material to waterproof and repair your pool. Proven by years of experience, Sani-Tred products are solvent free, non-hazardous, non-flammable and have low VOC's. 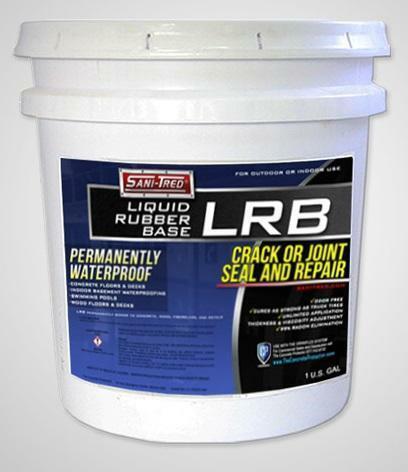 The SANI-TRED® system uses three products: PermaFlex™, LRB (Liquid Rubber Base) and TAV™ (Thickening Activator). 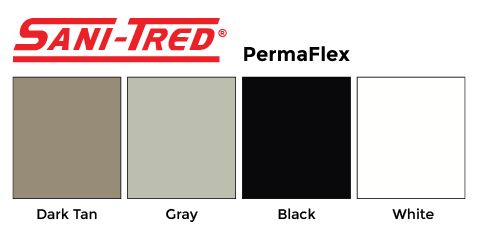 PermaFlex™ is the topcoat that seals concrete, fiberglass and gunnite pools. It also functions as a first priming coat when using LRB (Liquid Rubber Base) and TAV™ (Thickening Activator). The priming coat fills pores, pock holes, and pinholes in the substrate. Cracks are formed by movement, this movement may reoccur several times per year. Most cementitious concrete pool repair products have zero flexibility and zero elongation. When this movement does reoccur the crack will reflect through the cementitious material. Knowing this it is obvious that no cementitious material can perform even as well as SANI-TRED®. The most basic pool crack repair or any concrete pool repair cannot be repaired using cementousious material because they lack every physical quality necessary in order to create a flexiable permanent repair. NOTE: SANI-TRED® has mild chlorine/bromine resistance. SANI-TRED®should be painted/ lined/ coated after installation to take advantage of its extended life. Elongation Memory Technology® ensures that when SANI-TRED® products are compressed and relaxed, they maintain their original shape and size preventing distortion. These powerful forces such as freeze/thaw cycles, ground water pressure, vibration and sudden shock are a major cause of patch material failure. No other products can duplicate this transformation, because no other single component coating product may be applied at great thickness like LRB, molecularly bond to themselves and retain negative hydrostatic pressure. Additional advantages are that the coating and repairs remain flexible, are permanently bonded to the surface and will expand and contract with the concrete during temperature extremes to remain water-­tight! Permanent Elongation TM provides that SANI-TRED® products never harden or become brittle. They maintain flexibility and only become stronger with age without breaking down as other coatings do. 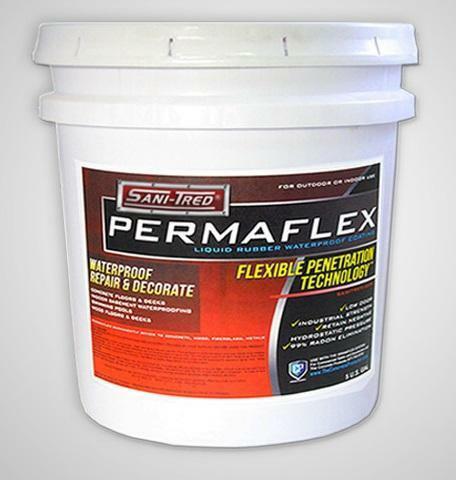 SANI-TRED® Permaflex™ deep penetrates and strengthens weak concrete or mortar joints which prevent detachment from these types of weak substrates as other coatings are known to do. Sani-Tred Perma­Flex™, (liquid rubber primer and top coating), penetrates deeply into the pores of the substrate, (foundation building material), and produces tiny solid rubber sealing plugs due to Flexible Penetration Technology®. These tiny plugs or sealing tentacles in each and every pore or small crack in the substrate is what holds back and retains ground water pressure before it has a chance to reach the SANI-TRED® coating surface to push it off, en masse, as with other types of coatings. These sealing tentacles work like tiny, high pressure, hydraulic O-rings and one of the unique qualities that allow SANI-TRED® to hold back great pressure without failure! The compared material may be claimed as a ‘ one-step’ product. No product or system can possibly be a one-step application and truly remain permanent. In order to permanently adhere, the material MUST penetrate into the substrate NOT just stick to the surface. Yet, in order for any material to be capable of patching joints, seams, cracks, holes and rough areas it MUST be viscous or thick enough to cling vertically. If a material is thick enough to cling vertically then it can not possibly penetrate into the substrate in order to obtain a permanent adhesion. This is why the SANI-TRED® system is not a one-­step application. If requires multiple steps to permanently adhere to the concrete while fixing cracks, joints, seams and holes. Colour names only. Actual colour may be different than shown.